When flying Singapore Airlines First Class from Changi Airport, you’re in for an extraordinary lounge treatment: The Private Room. No guests, no Singapore Airlines KrisFlyer Elite Members flying business or coach, no Star Alliance First Class passengers. This lounge is reserved exclusively for passengers holding Singapore Airlines First Class boarding passes. In exchange you get personalized and highly attentive service away from the crowds. My flight SQ211 from Singapore to Sydney was leaving at 9:40am, so I had to wake-up early to experience the Private Room. 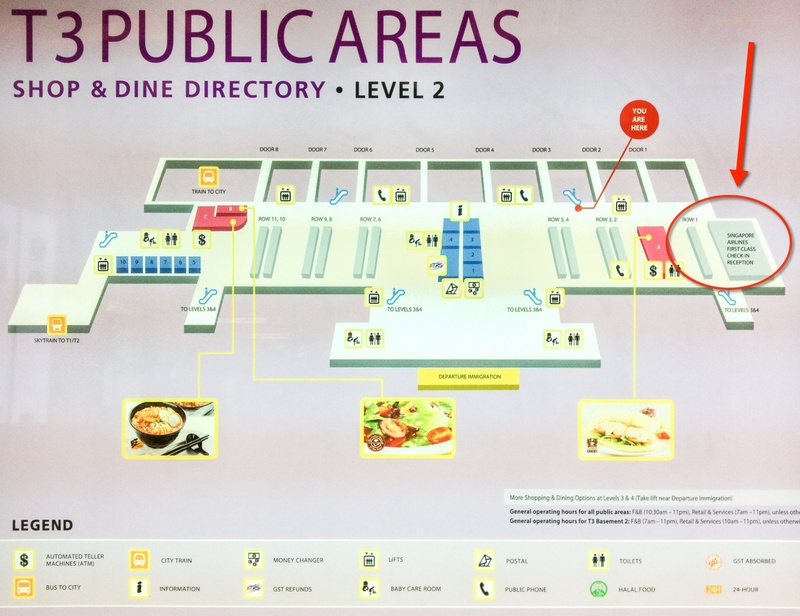 Fortunately, I was staying at the Crowne Plaza Changi Aiport which is connected to Terminal 3 and walking distance from the Singapore Airlines First Class Check-in Reception. The First Class Reception has a separate driveway for limos to pull-up. As I wanted the full experience, I exited Terminal 3 and walked up the First Class Check-in Reception. A porter took care of my luggage and a polite “Passenger Relations Officer” escorted me to a marble desk where I was seated while my check-in formalities were taking care of. Next was a dedicated immigration line where I was the only passenger present. 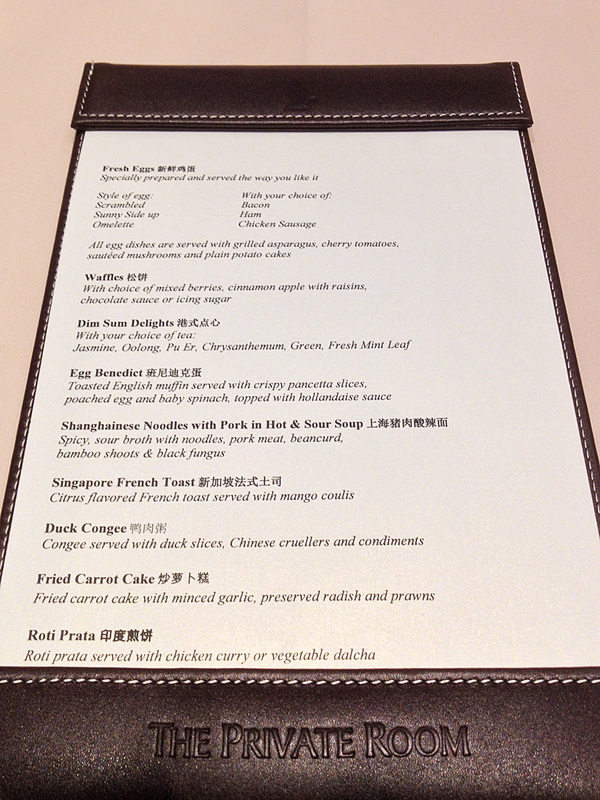 After immigration, a Singapore Airlines lounge agent escorted me to The Private Room which is connected to the SQ T3 First Class lounge. 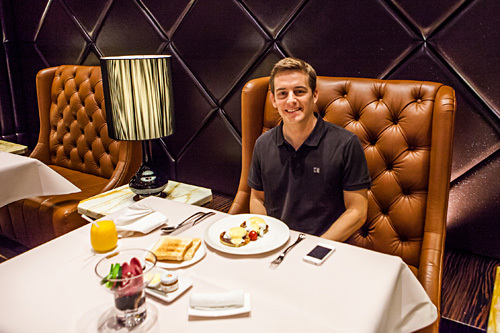 The Private Room has its own restaurant where you can order “A la Carte” or serve yourself at a buffet. Here’s a picture of the Breakfast Menu. 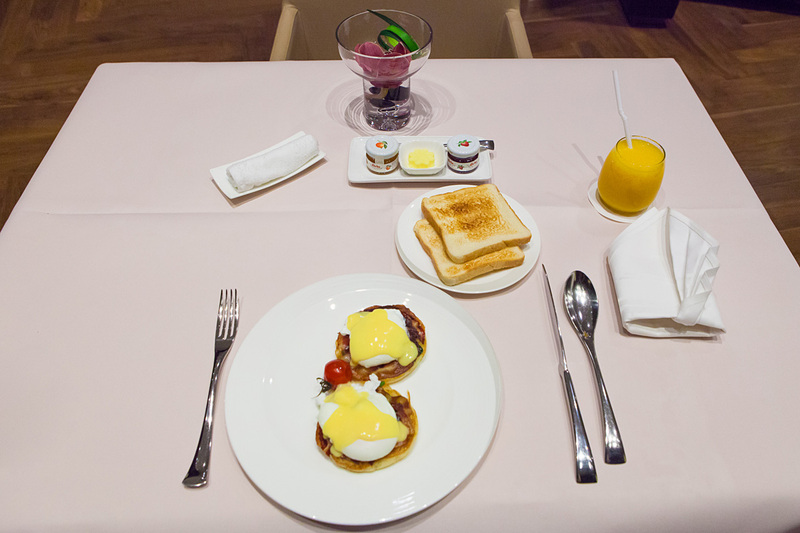 I went for Egg Benedict and a fresh orange juice, tasty! After breakfast, I relaxed a bit in one of the comfortable leather sofa’s before heading to the gate for my first Singapore Airlines First Class flight. What time does the Private Room open in the morning? Thank you. I was able to access for an hour after I landed on SQ11 on Sat Sept 6th; around 4.30am, they asked me to move to the First Class Lounge. Thanks for your input Simon!